By about March most people, particularly die-hard farmer's market shoppers, are getting pretty tired of root vegetables. Even I'm ready for some new things, and I can eat sweet potatoes, braised red cabbage, and baked apples ad infintum. One of the nice things about our local year-round farmer's market is that the root vegetable selection is very broad-- different kinds of beets, sunchokes, kohlrabi, celeriac, turnips, radishes, purple potatoes, parsnips, and rutabagas are available. I do like those more unusual root vegetables, they're a great way to mix up your weekly starch intake, and they usually take nicely to being roasted or sliced into a gratin or pureed into a potato mash. However, I'm often at a loss on how to use rutabaga and kohlrabi in particular. Turnips have a certain bitter profile that stands up nicely to richness (alongside duck and apples) or sweetness (roasted with a maple glaze). Celeriac has a celery-ness that's familiar and works awesomely pureed into soups, sunchokes are one of my favorite roast vegetable side dishes, and cook quickly to boot. But a rutabaga? Well, it's just sort of very hard and reminds of a turnip. 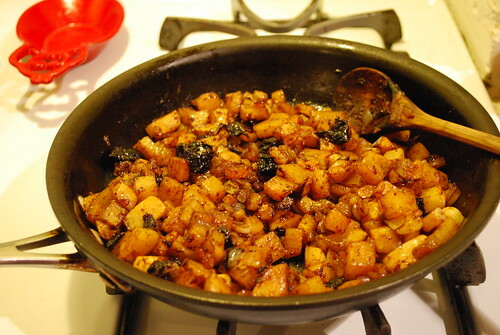 So when I happened upon a recipe for Rutabaga Caponata is was excited to try it out. Plus, the recipe is from DC's Komi Restaurant, where I took Paul for his birthday when we'd just begun dating. And the recipe? It's pretty great, it has a nice sweet-sour balance going on, with the heft of a roast root vegetable at it's base. I've tweaked the recipe a bit, but don't be put off by the unusual ingredients, they really work. Adapted from Komi Restaurant. Don't be alarmed by the cocoa powder, it is not distinguishable and merely adds a bit of depth a earthiness to the mixture (see here for more info on the classic caponata). This is a great winter side dish. 1. Preheat the oven to 415 F. Line a baking sheet with aluminum foil, place the diced rutabagas on the sheet and toss with olive oil and salt to coat. Roast for about 40 minutes or until they are tender and lightly browned on the outside. Set aside to cool. 2. In a large pan over medium heat, heat some olive oil, add the onion and cook, stirring, until it is soft and beginning to caramelize, about 15 minutes. Then add the garlic, raisins, and prunes, stirring to mix. 3. 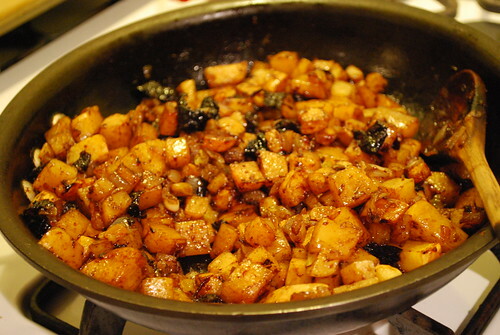 Add the balsamic vinegar, scraping the pan to deglaze it and incorporate the addition. Add the roasted rutabaga, pine nuts, red pepper flakes, sugar to taste, cinnamon, nutmeg and chocolate or cocoa powder. Season with salt and pepper to taste. Serve warm or at room temperature. What an interesting way to prepare rutabaga! I really like kohlrabi. I prefer it raw in salads and coleslaws, though. I don't know if I've ever used rutabaga in anything. So, your recipe looks interesting. This looks amazing! I'm excited to try the recipe later this week.